Below is the press release..
Music channel MTV Base ignited a fierce social media debate about the best of Nigerian music following a programme which aired on Nigeria’s Independence Day called “The Best Naija Songs Ever on MTV Base”. Other artists/tracks that received an honourable mention included: Styl Plus: Olufunmi; Shank: Julie; DJ Jimmy Jatt: Stylee; Ikechukwu feat. Don Jazzy & D’banj: Wind Am Well; D’Banj: Fall in Love. Continued Okosi, “The important thing is that everyone has their own views about what makes a great song or a great artist, and we’re keen to hear their thoughts. We are continuing the debate and encouraging music fans to further engage with the campaign via our digital media platforms. We will also be filming a special MTV Base Nigerian music roundtable in Lagos on this topic, featuring artistes, DJs and music industry experts. The roundtable will air on MTV Base in November 2014 as part of the channel’s build up to our 10th birthday celebrations. 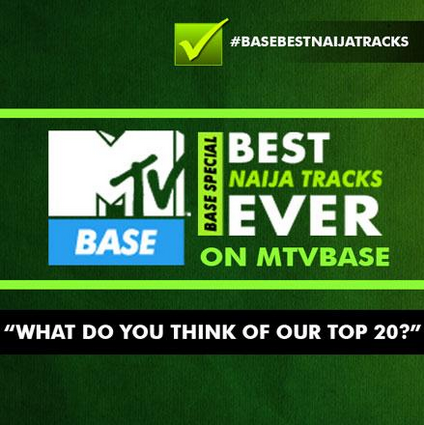 Simultaneously, MTV Base is challenging music fans to create their own lists of Best Naija Tracks, and to post them on MTV Base social media assets, or to get involved in the conversation by using the hashtag #BaseBestNaijaTracks. Those engaging in the campaign stand the chance to have their comments featured in the roundtable discussion on MTV Base."